Love is always in bloom with these darling Flower Theme Garden Party favors! 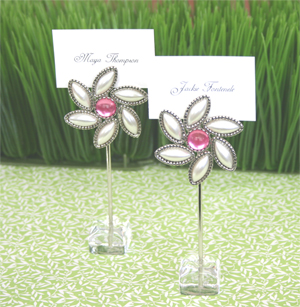 Celebrate nature's bounty when your decorate your garden theme party tables with these charming placecard holders - perfect for favors Sweet 16, Quineanera favors, bridal shower favors, girl baby shower favors - this list can go on and on! What a beautiful way to hold your guests' place cards or also very useful at church functions, office parties and more to mark the dish names on the buffet style receptions. Made from metal and ivory pearl-like beads with a hint of pink, these pretty little flowers could not be more adorable. Each small but heavy clear base holds the flowers while minimizing space used on your reception tables. 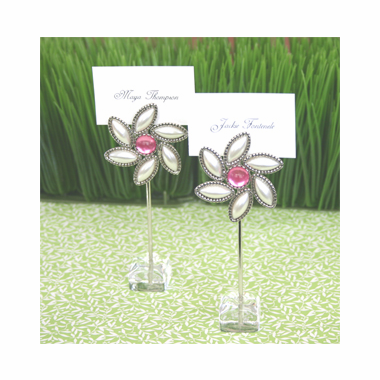 Guests will appreciate your attention to detail and later use these decorative flower favors as memo clips or photo holders. Blank white place cards are included. Each measures 2.25"W x 5"H and comes in a set of 12 placecard holders. *This item is on closeout - as a result, please be advised the holders are not returnable.